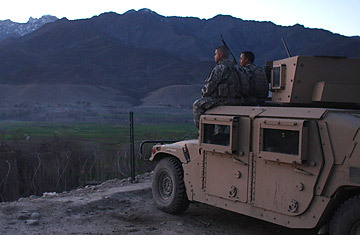 Soldiers with the U.S. Army 1-6 Field Artillery division keep morning guard on a roadway in a village with a history of Taliban activity February 26, 2009 in Mangow, Afghanistan. Can Pakistan Be Untangled from the Taliban? Did George Bush leave one of his old speeches in the Resolute Desk? As President Obama unveiled his Afghanistan-Pakistan policy Friday, it was hard to miss the echoes of his predecessor's "surge" strategy in Iraq. Indeed, says James Dobbins, the State Department veteran who served as President Bush's first envoy to Afghanistan, Obama's plan is "largely an extension of where the Bush Administration, in its last years, was heading,with some refinements and additions." The parallels don't end there. Bush's "surge" strategy was twinned with an effort to capitalize on disputes between al-Qaeda and its Iraqi allies; eventually, the majority of Sunni insurgents were induced, with promises of money or political power, to stop attacking U.S. forces and turn their guns on the jihadists. Obama, likewise, hopes to drive a wedge between what he describes as "uncompromising" Taliban and al-Qaeda leaders on the one hand, and less implacable insurgents who may be more inclined, for the right price, to make a deal with Western forces or the Afghan government. And finally, although Obama earlier this week insisted that any Afghanistan plan had to have an exit strategy, he notably avoided articulating one today  not unlike his predecessor on Iraq. Although it was hardly a bold departure from the Bush plan, many veteran Afghanistan hands give Obama's plan grace marks for some important innovations. Dobbins, who now heads Rand Corp's International Security and Defense Policy Center, says the President is smart to "package Afghanistan and Pakistan as a common, interrelated problem," something Bush never did. He also credits Obama for "the recognition that we need to empower local communities to deal with local concerns, including security." The plan to devote 4,000 new troops to training Afghan forces is another smart call, says Peter Bergen of the New America Foundation: "The Afghan Army has been too small for too long." Obama also won bipartisan praise on the Hill for endorsing the Kerry-Lugar bill to greatly increase non-military funding to Pakistan (to $1.5 billion a year for five years) and to apply more rigorous checks on military aid to Islamabad. But some observers were skeptical, pointing out that the areas where Pakistan most needs civilian spending are also the areas where al-Qaeda, the Taliban and other militant groups have greater control than the government. The fear is that large chunks of American aid may end up in the pockets of the very people it is meant to defeat. Says Bergen: "How do you spend the money amid a nasty insurgency? Who do you give the money to in a way that isn't counterproductive?" There are questions, too, about what kinds of "benchmarks" can be applied to measure the success of the Obama plan. Matthew Leavitt, a counterterrorism and intelligence expert at the Washington Institute for Near East Policy, says progress will be easier to measure in Afghanistan than in Pakistan. "On the Afghan side, you can quantify progress  how many police have been trained, how many missions have they carried out, how many people have they captures. But that's harder to do in Pakistan." In any event, many of Obama's innovations will take years to produce results, and, in the meantime, there's still a war to fight. Anyone looking to the President for a bold new military strategy would have been disappointed. "I don't think there's anything [in the speech] that we're going to look back in some years and say, 'This was a turning point in the way we fight a counterinsurgency,'" says Jason Campbell, an Afghanistan expert at the Brookings Institute. In the main, that's because Obama doesn't have the resources for a dramatic military push  although that may come later. Stephen Biddle, a defense expert at the Council on Foreign Relations, predicts that as the situation in Iraq grows less volatile, Obama will be able to move more troops from there to Afghanistan. In military terms the additional troops designated for Afghanistan this year are "more a down-payment than the final plan," says Biddle. Campbell and Biddle both note that, even with the 21,000 troops Obama has promised, Gen. David McKiernan, who heads NATO and U.S. forces in Afghanistan, will not have the manpower to defeat a raging insurgency. Until he can get more reinforcements from Iraq, McKiernan will have to adopt an "inkblot" strategy, defending small portions of the country and hoping the security blanket spreads to neighboring areas. McKiernan is "very likely to apply classical counterinsurgency techniques that we saw in Iraq in 2007  defend the population, deploy in small, dispersed positions, use minimal firepower," says Biddle. But even a cautious military posture will "unquestionably lead to higher casualty rates."